This entry was posted on November 27, 2017 at 8:13 am and is filed under Lower Manhattan, Old print ads, Random signage. You can follow any responses to this entry through the RSS 2.0 feed. You can leave a response, or trackback from your own site. The stroking part concerns me. I’m calling HR. You’ve shown so mannnnny terrific signs from ‘long gone NYC businesses,’ I wish the historians of the city had a program — like the ROUTE 66 folks have come to recognize — people have become very attached to these landmark designs. Today, there is a movement from Chicago to LA to save and restore the vintage signs. They are commercial advertising but they were guideposts to exciting places where memories abound. They are also designs showing different art styles of the period. Some Rt66 signs have been gathered for display in a couple of park collections. Amazingly, even more have been kept at the origional site (with the new business adding their name during restoration or their own signage nearby.) Large, metal signs – with beautiful neon or exterior lighting – are very costly to reproduce; the modern day signs taking their places, are mostly plastic with interior lighting. Too many of these big flashing, twinkling, glowing lights with names and movement and giving direction or information seem to be headed to a recycle smelter and that is a loss of ‘yesteryears’ that should not happen to those who love NYC. I agree Audrey—and so do other folks here in NYC as well. But so far, I’m not aware of any movement to preserve these iconic 20th century store signs that continue to charm passersby. In that episode did they ride from Manhattan to Brooklyn/the Slope? Fantastic — the mention of the duo’s names makes me smile thinking of the conveyor line of chocolates. Judy gets ’10 points’ for a Perfect Comment! Considering today’s political and Hollywood headlines, I too join Ty in the looming question. What the heck is candy STROKING? That gave me pause also Audrey – when I read Ty’s comment. (Stroking). However I am commenting after yours because I don’t want to *encourage* Ty. (Remembering another comment of his which was *supposedly* accidental… & Ephemeral really believes in free speech!). I am guessing “stroking” is brushing chocolate *over* another candy? (That’s my best shot). Ephemeral – please end our misery (if you have this cryptic knowledge). Lol – now I am really hungry for a box of chocolate w/ the creme fondant & caramel centers. The internet is *forever* though. (Except when it’s not – but then there is the Wayback Machine…). Well then, Nolo Contendere, Ipso Facto, E Pluribus Unum and whatever other Latin I can throw at you. Lol – our Ephemeral comments crossed. That must be good luck – like speaking at the exact same time. 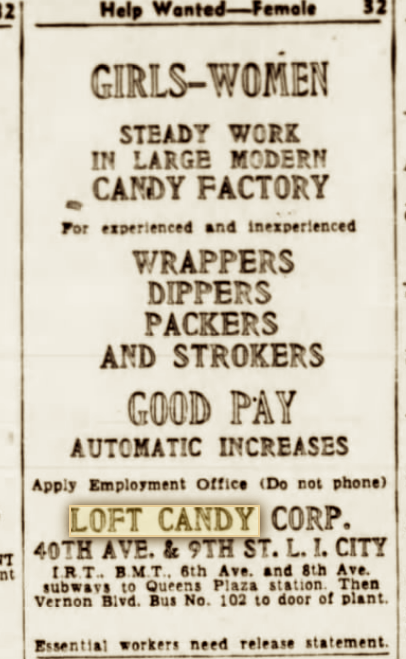 According to ‘Industry Wage Survey: Candy and Other Confectionery Products’ (August 1975), a “stroker” is the enrobing machine operator’s helper. Also known as a “Separator”, “Slider”, Streaker”, “Stringer”. Must I explain EVERYTHING to you greenhorns? I guessed right. Sort of as I said ‘brushing’ & not ‘enrobing’. That’s what I meant though! Lol. I read your comment after my guess lisaakalisa. (Does your screen name mean Lisa also known as Lisa? Or is your last name Akalisa? If the former it is funny & brilliant. If the latter it’s a pretty name). We realy ought to get down to the ‘Sticky Fingers’ discussion of quality chocolates, which this company obviously provided the citizens of NYC. Do you prefer chocolate covered pecans, whole almonds or peanuts? Are you one of the folks who swab your chin after down’n the messy but delicious chocolate covered cherries? Perhaps you like the stuff that sticks your teeth together with a heavy-duty caramel. Are you a marshmellow creame fan? Fess up…you got a favorite? Can you eat ONE piece and then stop? Do you like chocolates FROZEN in the deep freeze or hot and gooey on a summer’s afternoon? 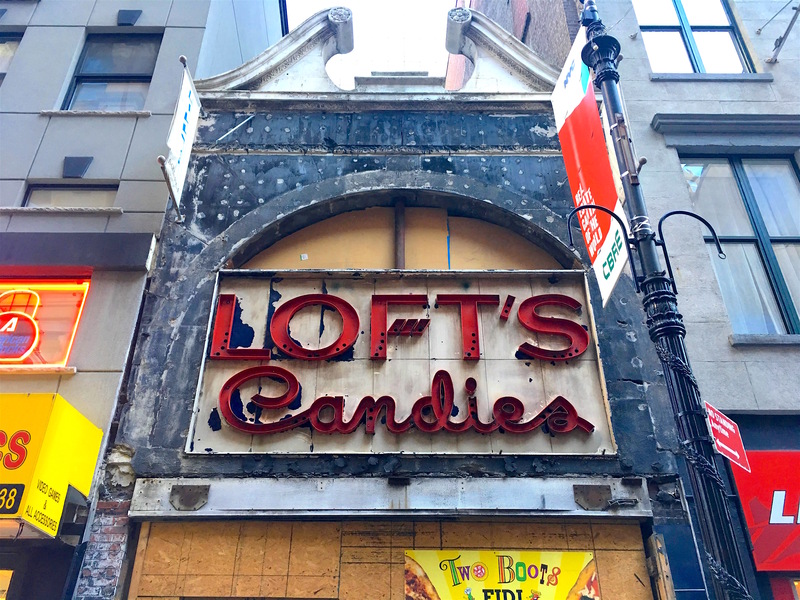 ‘Chocolate candy and eat’n it’ is a serious discussion…These LOFT Candy Shops were allllllllllllllllllllllll over the city, so there should be plenty of CANDY CONFESSIONS. Come on, conefess…share your delicious memories ‘n favorites…. burrrrp! There was a similar sign uncovered on Jay Street in downtown Brooklyn for a bit. Does anyone know the address in Park Slope. (In photo above). I don’t remember an old sign. (I lived there for awhile). Which Avenue? Most of those sort of shops were on 5th Ave.
… Now I am hungry for Mr.Falafel (restaurant there).